(From IEE Micromouse Championships) The maze shall comprise 16 x 16 multiples of an 18cm x 18cm unit square. The walls constituting the maze shall be 5cm high and 1.2cm thick. Passageways between the walls shall be 16.8cm wide. The outside wall shall enclose the entire maze. The side of the maze walls shall be white, and the top of the walls shall be red. The floor of the maze shall be made of wood and finished with a non-gloss black paint. The coating on the top and side of the wall shall be selected to reflect infrared light and the coating on the floor shall absorb it. The start of the maze shall be located at one of the four corners. The starting square shall have walls on three sides. The starting square orientation shall be such that when the open wall is to the 'north', outside maze walls are on the 'west', and 'south'. At the centre of the maze shall be a large opening, which is composed of 4 unit squares. This central square shall be destination. A red post 20cm high and 2.5cm on each side may be placed at the centre of the large Destination Square if requested by the handler. The dimensions of the maze shall be accurate to within 5 percent or 2cm, whichever is less. Assembly joints on the maze floor shall not involve steps of greater than 0.5mm. The change of slope at an assembly joint shall not be greater than 4 degrees. Gaps between the walls of adjacent squares shall not be greater than 1 mm. A start sensor will be placed at the boundary between the starting unit square and the next unit square. A destination sensor will be placed at the entrance to the destination square. The infrared beam of each sensor is horizontal and positioned 1cm above the floor. Multiple paths to the destination square are allowed and are to be expected. - 5x5 and 16x16 (full) maze available. - Easily assembled and disassembled. - Walls and posts included. 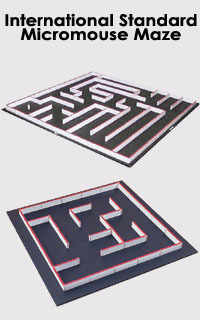 - 16x16 full size maze is installed on the provided aluminum frame.